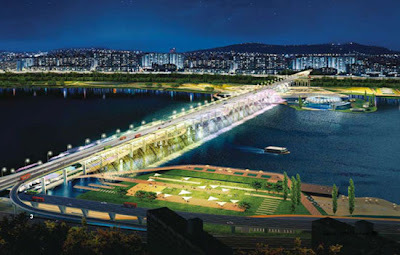 Banpo bridge has been remodeled into a huge and beautiful fountain. 380 nozzles on both sides of the bridge pump out 60 tons of water 20 meters down to the river per minute. 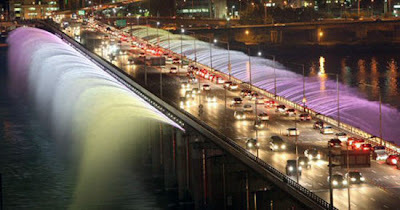 The water fountain extends a combined length of 1.2 kilometers along the sides of the bridge. 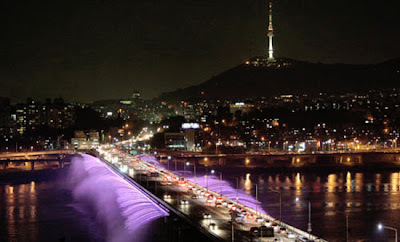 The water for the fountain is pumped up from the river below which is again returned to the river. 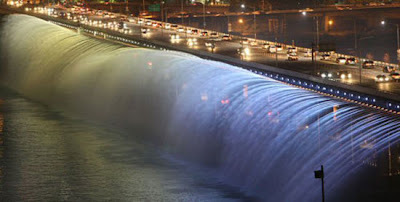 This is one unique fountain which pumps water down and not up; the water from the fountain falls gracefully from the bridge into the river, much like a waterfall. 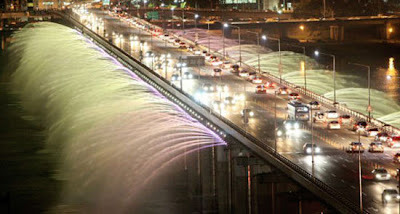 Apart from this, the water sprays also "dance" to music in 100 different configurations and what makes it even more special is the special lighting at evenings. A Good Reason To Keep Your Clothes On. Make Three-Dimensional Snowflakes With Paper. 30 Modern and Creative Chair Designs – Part 2. Amazing Coffee Tables From Cars. The Football Stadium For FC Barcelona. University of London, Birkbeck College. Innovative and Cool Bookcase Designs – Part 3. Creative and Modern Lamp Designs – Part 4. Coolest and Unusual Pillow Designs – Part 3.